Our one hour video is broken into 28 short modules that explain in plain English what you must know to defend yourself against a DUI charge. You can view it anytime on your computer, tablet or even mobile phone. Users also receive California DUI documents including Standard Discovery Requests, and relevant California DUI regulations. This guide is for individuals who have been charged with violation of Vehicle Code 23152, subsections (a) and/or (b), which prohibit driving under the influence of any alcoholic beverage or to drive with a Blood Alcohol Content of .08 percent or higher. 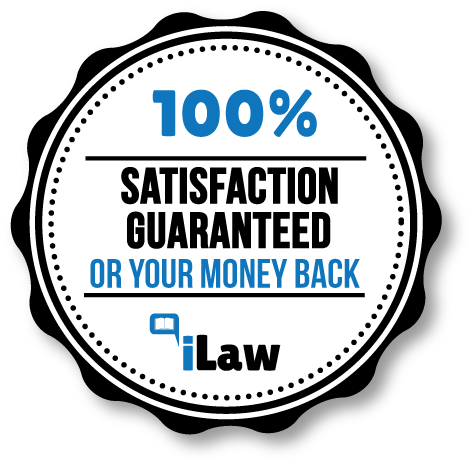 iLaw is so confident in our product that if you are not completely satisfied, we will issue you a full refund to your credit or debit card, no questions asked. Simply Put: You have NOTHING to lose and everything to gain by beating your DUI yourself. Being convicted of a first time DUI offense in California can carry these possible penalties, so you need to know exactly what you are doing when you defend yourself. At the DMV hearing, the evidence will be presented to justify suspending your license. The hearing officer will decide if the evidence is sufficient. Don’t miss your arraignment. This is a formal court hearing, during which you will have the opportunity to inspect the evidence against you, which is usually a police report. "That speeding ticket class worked! My first speeding ticket ever was dismissed. No fine, no points!" "The eviction class helped me tremendously in Housing Court. Thank you iLaw." "After taking the class I had my security deposit back within 4 days. Thank you iLaw!" A: iLaw is an online legal education provider for individuals who cannot or will not hire a lawyer. We create state-specific and topic-specific classes and materials for every-day legal issues, from how to fight a speeding ticket in New York, to How to evict your Tenant in Texas. A: Users sign in and watch video lessons for their state-specific issue on their computer, tablet, or mobile device. They then review the Materials, which include legal documents, forms, and guide(s). If they feel comfortable enough after this process they can use their newly acquired knowledge to tackle their legal issue on their own. If not, they’ll be in a much better position when selecting a lawyer. Q: Do lawyers produce the materials? A: Yes. Through our rigorous selection process, iLaw selects attorneys from across the country to create engaging, informative, easy-to-understand content. Our graphics and artist team then create beautiful, engaging presentations for our users. Q: How Long does it take to take the class and review the materials? A: We’ve found users average anywhere from 2 to 4 hours to watch the videos and review the materials. A: It depends on which class the user enrolls in. Prices currently range from $49 per class to $159 per class. Q: What if I don’t get anything out of the class and materials and decide early-on that this isn’t for me? A: iLaw has carefully crafted its curriculum and classes to be easy to understand, pragmatic, and goal-oriented. If however, the user is unsatisfied for whatever reason, simply email us at info@ilawlearning.com with the subject matter “Refund” within 30 Days of purchasing the class. We’ll refund your purchase price no questions asked. Q: Can iLaw help me with advice for my specific legal situation? A: No. iLaw is not a law firm and cannot address any issues related to your legal situation. Q: Can iLaw refer me to a lawyer to help me with my lawsuit? A: No. Though many legal start-ups are simply referral services cloaked in bells and whistles, iLaw will under no circumstances refer you to a lawyer. We have created the materials to help you tackle your issue on your own. If you determine after watching and reviewing our materials that you still need a lawyer please contact your County bar association. Q: Can I download the videos and watch them offline? A: Currently we do not offer this option. All video viewing must be done online within your web browser. © iLaw.com 2014. All rights reserved.